The LG Life’s Good Happiness Study is a pioneering initiative commissioned by LG Electronics India Limited. LG’s philosophy is based on humanity. As part of its commitment of making life good for people, the LG’s Life Good Happiness study is an initiative undertaken to understand the social construction of happiness and what makes people of India happy. However, Life’s Good is an idea that encompasses more than just pure tangibles and goes far beyond the products and gadgets to reflect a philosophy or an aspiration for how life should and can be lived. Therefore LG wanted to understand what makes the Indians tick, how the Indian consumer’s aspirations and vision for a happy life are shaped and what are the things that make them happy across cities. Happiness has now become the subject of much study and debate around the world. As life on earth becomes increasingly complex – fast and technological – it seems to have become more important to everyone to understand whether these things really give us more happiness. Happiness is one of the most important values and aspects of life for everyone. Linking to a personal or meaningful cause is a super-powerful way for brands to show they care and hence LG decided to own the very idea of happiness. Hill+Knowlton Strategies suggested that LG commission a pan-India study to decode the happiness of the people of India. A barometer of the level of happiness, the study was conducted in 16 cities across the country. The main parameters against which happiness was measured included 4 Ps: Purpose, Pleasure, Passion and Pursuit – underpinned by the Context of their lives. 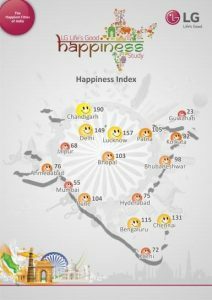 The Top 5 happiest cities – Chandigarh, Lucknow, Delhi, Chennai and Bengaluru shared the broad theme of happiness. People of these cities were happy with the amount of time they get to spend with family the quality of relationship they share with friends and family. They were also happy with the kind of control they had over their lives with respect to doing what they want and taking decisions for themselves. The LG Happiness Index survey threw up interesting findings. For instance, the need to be happy is the topmost need across Indians today, ahead of aspects like wanting to be respected, wanting to be loved or being of service to others. Indians are also quite clever about segregating factors that they have limited control over, e.g. the environment around them, social values or the state of their city infrastructure, and those that lie within their purview – e.g. their own lives, so they don’t allow external factors to unduly impact their happiness. LG also leveraged the study to create a connect with its employees resulting in communication across cities. In-store communication created a customer connect and strong brand recall, this disruptive communication also created positive vibes in the store. A survey focusing on ‘What makes Indians happy’ decoded attributes and drivers of happiness across 16 cities in India. The results of this IMRB International conducted survey was compiled and titled The LG Life’s Good Happiness Study – The Happiest Cities of India. The study was first shared with leading financial daily Mint and broadcaster Network 18 on embargo for large exclusive features. This was followed by a media conference where celeb-actor Mandira Bedi along with Mr Niladri Datta, Head Corporate Marketing, LG Electronics India and Ms Priyadarshini Narendra – Vice President, PQR – IMRB International; came together to unveil the findings of the survey to a pan India audience. There was also a panel discussion on the key findings from the Happiness Study with the renowned sociologist Dr. Amrit Srinivasan. Post the conference, the campaign culminated in Chandigarh as it was the “Happiest City in India”. A media briefing was called where the Mayor of Chandigarh was felicitated by the LG team. The LG Life’s Good Happiness Study received overwhelming response across the country. The study started conversations around the ‘happiest cities in India’, there was a huge brand recall associated with the study. The Happiness Study strengthened the company’s philosophy of making ‘Life Good’. At the press conference in Delhi where the study was launched for pan India, there was attendance of quality media from all verticals – Print, Online and Broadcast. Total media attendance was 98, including wires, mainlines, financials, regionals, magazines, broadcast, online and photographers. Garnered 137 print, 108 online and 27 broadcast stories across media. As a company, LG Electronics constantly tries to listen to its consumers and learn from them that has brought them closer to the consumers. LG in its endless effort to explore, pioneer and bring alive those experiences plans to conduct a similar study on the Happiness quotient in cities across 56 countries.